It is hardly surprising that 58033 looks in pristine condition here, as it's only its third day in traffic. On 22 October 1985 it is pictured passing Somerton (between Banbury and Oxford) with the 7V44 09:34 Three Spires (Coventry) to Didcot Power Station MGR coal train. 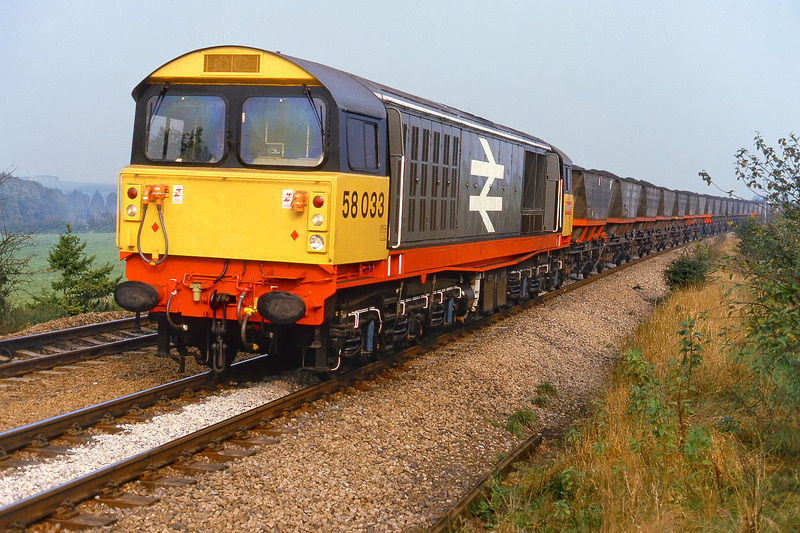 Pictures of class 58s in clean condition are fairly uncommon, as not only was cleaning of a purely freight only locomotive a low priority, but the recessed bodysides of these machines meant that automated washing plants were less than effective.